I once talked about Romance Novels: Why the Stereotype? I love that post. It is one of my favorites. I came out of the closet as a romance novel fan. I thought romance novels were all bodice rippers and a half naked females on the cover that needed rescued. Maybe they used to all be that way, but not anymore. 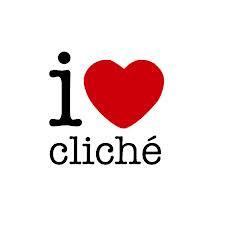 Today I'd like to talk about romance cliches. As in predictability. We know what's going to happen--so to speak. They end up together. It wouldn't be a romance novel if that wasn't the case. Am I right? Is this a good thing? Do you like knowing there is a happy ending coming? Or is that what you don't like about them? I personally enjoy the predictability. I do. When I find myself stressed in every day life I know I can pick up a romance novel and have something turn out the way it should. It isn't about the end result for me in romance novels. It is about the journey. What is this couples story? How do they make it work? Are they passionate or are they the peaceful quiet kind of love that comes from years of friendship? I do enjoy many different genre's and I love those to keep me guessing. I like not knowing what is going to happen. I love being shocked when things don't go as I think they should. But, in my romance novels I really enjoy knowing it is all going to be OK.
How about you? Do you like the predictability? Or are you wanting the genre to shake it up a bit? I have to agree with you. I like the predictability of romance novels. It's my go-to genre when I don't want to think. I love knowing I'm going to get a love story and it is going to end with the them together and happy. I need that. Life is hard enough and I want to know that somewhere...someone is getting everything lined up. I also agree. Life can be so stressful and I need some extra romance in my life off and on. Even though I know that the MC and love interest will end up together, the journey can still be unpredictable and surprising and that is enough for me in that genre. It isn't the only genre I read, so when I need something different I pick up a YA Dystopian, Sci-Fi, Paranormal, Fanatasy, Contemporary, or just a classic. However, I would be really disappointed to be needing that happy ending only to find a sad ending (one reason I rarely read a Nicholas Sparks book). I've never read Nicholas Sparks for that very reason! I've seen a few films and I'm always like...these are so sad! Why would I want to read that?? I love the journey. I love actually seeing the couple fall in love and feeling it along with them. That to me is the whole point of the genre! We want romance! Give it to us!!! Would you like to try Emma Rose Romance books? Lots of freebies there oif you join her newsletter.